Things are back to normal. Fuzz returned to school, Todd’s left for work and I have to start focusing on some volunteer projects — the first of which is coordinating our troop’s Girl Scout cookies. I was cookie coordinator last year and thought I had it all down; then they changed things up a bit this year and the more seasoned stay-at-home dad cookie coordinator who was helping me moved away. So I’m on my own and a little nervous. To help remind me that *It’s just cookies* and this is supposed to fun, I’ll be linking to various articles on Girl Scout Cookies. I’ll also be collecting more recipes that call for them, so if you know of any or see any that look exceptional, shoot me an email. I’ve also created a Girl Scout Cookie Recipe category in the left sidebar. So far, the only thing I’ve put there is Thin Mint Pie which is extremely delicious and a very good use for Thin Mints. As I come across new recipes, I’ll add them to the category. This is my third year as “cookie mom” for our troop. Compared to what the leaders do for the girls, this is a small contribution to the troop’s overall financial health – but it’s a small troop, only 10 girls and 2 are sisters. Have you seen the recipes on the little brownie website? The sales materials suggest that the girls bundle boxes of cookies with recipes to increase booth sales. We always make room for Thin Mints, Anna! Thanks for the advance notice on GS cookie season. It’s kind of nice getting back in the routine, isn’t it? It’s very fitting that you’re the Girl Scout Cookie lady! I’m sure you’ll do a great job! I made a shortbread (can’t remember the name of it as my memory is shot right now), but it’s on my blog and it tastes a lot like the Samoas. They were so tasty. I made that pie last year, it was delicious! I look forward to more recipes, I lead my daughter’s Daisy troop, and this is the first year Daisy’s are selling cookies. Fun (I think)! Anna, I felt your pain about coordinating Girl Scout cookies many years ago. The worst day for me was when the shipment makes it to your location. We did Girl Scout cookies for the whole county so we filled the VFW hall. You need lots of hands on people. You’ve probably already seen, but Baking Bites recently posted about Girl Scout cookies and has recipe for most of them. 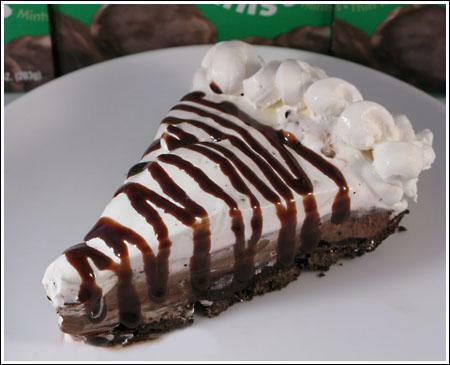 And another thin mint dessert. That’s a big job, but no doubt you’ll do GREAT! You’re a good person, to do this. Oooooh boy, that pie!! Wowza. Admittedly, not quite a recipe, but it is worth adding that Thin Mints improve in taste (at least, IMHO, and I’m not a big chocolate mint person) if they are housed in the freezer! This is NOT a good post to start off the year!! Your picture is good enough to eat! This sounds nice and easy…maybe a sometimes treat. I MUST TRY THIS! I’ll just try not to eat the whole thing! !